Let’s say something exciting is happening at your company. Live streaming video is an excellent way to connect with your customers and and is enjoying a boom right now because viewers are taken with the live experience. Mediapolis specializes in turnkey, live, multi-cam HD production for TV and online broadcasting (webcasting) of live events. Before webcasts, webinars were a simple way to communicate your message audience and answer questions. But without live video of the presenter, the experience was easy for the audience to tune out. Live streaming or webcasting gives you an effective way to connect with your audience, even when the presenter can’t physically be in front of the audience. Consequently higher engagement is achieved with a live streaming experience. Full-service webcasting includes a skilled technician who coordinates all aspects of the Webcast from start to finish. During event production, we bring everything you need for the webcast. A high-speed Internet connection is the only requirement. Mediapolis is a complete live event streaming services provider. Our professional, affordable streaming production service is capable of delivering HD live streams for any type of event. Hence you can choose between a single or multiple cameras. Internet Access – Is high-speed internet access available at the event venue? What CDN will be used to live stream? Will you use a free or subscription-based platform? Duration – Is this a single event or a long term commitment? Is the event a half-day or a full-day? Size of Online Audience – How many online viewers do you expect? Do you need more than one camera? Does your venue provide house sound, lighting, AV and staging? Do you need live closed captioning? Every live event streaming needs a content delivery network (CDN) that provides the platform and the servers to reach your audience. 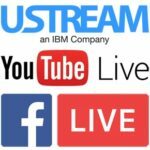 CDN options range from free services such as YouTube Live, Facebook Live and Vimeo Live to subscription based platforms like Ustream (now IBM Cloud Video) or Livestream or a licensed enterprise CDN like Akamai. The subscription based platforms are more business directed and let you go “white label” to completely brand the service as your own. If you have proprietary information, then these subscription-based platforms are for you. We can even help you setup and manage your channel for example if this is your first time streaming. A single camera is the most basic way to stream an event. It is ideal for capturing a single presenter. If that presenter is stationary during the event we can also incorporate their presentation slides within the live stream. We can live switch between the presenter and the slides or frame the sources as a picture-in-picture where the slides and the presenter occupy portions of the screen. The ability to produce live events with a solo crew person is a huge competitive advantage because it reduces the live streaming costs for our clients. With multiple cameras your event takes on a higher degree of professionalism and viewer engagement. Multiple cameras provide audiences with the best viewer experience. Multi-camera setups work well with panels, conversations, performances or demonstrations. When only one camera is used with multiple speakers, the camera needs to pan from one speaker to the other. Multiple cameras eliminate this awkward camera movement. A typical two camera setup includes a master shot (Wide), a close up of the presenter. Multi-camera setups require more planning and lighting to make sure the footage from each camera matches. But with multiple cameras, you instantly create more visually dynamic and interesting scene. Multi-camera setups have two, three or four cameras and require a bigger crew and more equipment to capture the angles. Depending on the scale of the production, the crew may consist of camera operators, a technical director, a sound engineer and an encoding engineer. If the production is rather simple some crew members may do more than one job. Video, audio or animation from your PowerPoint or Keynote presentation can be incorporated into the recorded or live stream. We can also playback your HD videos. Professional graphics improve the production value of your broadcast and aid audience comprehension, engagement and brand awareness. Mediapolis can produce custom show openers, bumpers, logos, animations and titles that will make your brand sizzle. These graphics are an add-on service, but when incorporated in your live production the result is a cost-effective means of boosting the quality and depth to your webcast. We offer a full range of wireless and wired microphones to capture the sound of your event or we can tap into a venue’s house sound and patch that audio into our system. For smaller venues we can also provide a PA sound system so the in-house audience can hear the presentation. Picture-in-picture (PiP) is a feature that displays two video sources. PIP shows one source as the full picture and at the same time another source is displayed over the first source in a smaller window. A common and effective way of delivering instant video projection of speakers or performers at an event is called IMAG or image magnification. IMAG magnifies the person who is speaking on a large screen enabling those that are sitting further from the stage to be able to see them. The video projected on the same screen as the slide presentation and video playback. We can integrate remote speakers into your live stream using a telephone or Skype. A telephone interface allows us to capture high quality audio from a telephone and incorporate it into the presentation. Skype calls with video and audio can also be integrate into your live presentation and stream. Closed captioning is a requirement for both live and on-demand content. Section 504 declared civil rights for individuals with disabilities. Section 508 set the requirement for accessible technology. The 21st Century Video Accessibility Act (CVAA) sets clear rules for internet video programming and that requirement mandates captions for live and near-live events within 12 hours. There are software solutions that use artificial intelligence (AI) to transcribe the human voice in real-time, but the results are far from perfect. A better way is to use highly trained captioners and stenographers who listen to the live audio and type what they hear. The captioning is then embedded into the live stream. Your audience can be dispersed worldwide and watch your event directly from any internet-connected device, including computers, tablets, and smartphones. Clients, executives, fans, and customers can view a high quality live stream of the event in real time without having to be at the location, saving valuable time, energy and enabling you to reach viewers you would have never reached before. Your live event can be embedded to play on multiple websites – your website, clients’ website, sponsors’ website, or a customized landing page where you can control the video player’s size, background, layout, branding and even incorporate interactive chat. Therefore, you can even monetize your video stream with pay per view, subscriptions, advertising, shopping carts and with other options. At the end of the day, you’ll be given event analytics with real-time viewer profile data, so you’ll know your audience’s demographic, size, duration of viewership, access point, and more. Afterwards, you’ll have access to a video on demand (VOD) recording, but Mediapolis also offers a full range of editing and post-production services. We can edit segments from the show to create a “highlights video”. Live video produces footage that is easy to edit for use in other projects. Because we handle all editing ourselves, turn-around time is usually only a matter of days. We can also record a time-lapse of your live event. This footage gives you another piece of content to use in an event highlight video. It’s also perfect for showing a behind the scenes look that is popular on social media. We’ll work with your team to build the right package with the features you want and need. Then our experts will set it all up for you and see it through from start to finish. When you need live streaming event services in Minneapolis, please call us at (612) 486-2221 or email us through the contact us page for more information.